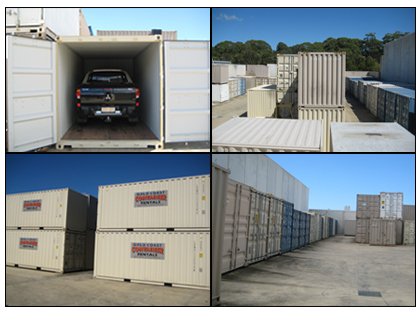 Gold Coast Containers have a broad range of shipping containers for hire that are perfect for a multitude of uses. A large portion of our business is due to the fact they provide great storage solutions. Long and short-term leases are offered with delivery available from Northern New South Wales to Brisbane. All of our containers are pest free, a maximum of three years old and are always maintained to a high standard. We are proud of our service history from South of the Tweed to Brisbane. It's what has kept our customers coming back. Delivered: The container is delivered to your property where it can be filled with your possessions. It remains on your property for the term of the lease. Delivered, packed & removed: Upon delivery of your container, time is given for it to be filled and when you are ready we return to pick it up. Your container is then kept in safe storage on our secure property. As our client you will be supplied with an access code for entry to the site. Onsite packing & storage: This option is often used as a less expensive and more flexible option to self storage units. The container is kept onsite in our secure facility, where you can pack it at your leisure. An electronic pass is supplied for easy access. This is a popular choice of storage as when you move home, the shipping containers can be freighted as they are. When dealing with Gold Coast Containers you're dealing with a family based team of professionals. We keep our prices low and customer service as the number one priority. Gold Coast Containers purchase prices aren't just highly competitive, they are the best from Brisbane to the Tweed! This backed up by our customer service makes sure our customers expectations are not only met, but comfortably surpassed. The variety of the shipping containers sizes and types is matched only by the number of uses. Unlike other container hire companies we offer a simple, fast and efficient service. In doing this we can limit our overheads making Gold Coast Containers the cheapest way to buy a container. Give us a call today and compare your quotes. We look forward to working with you. For more information or simply some help and advice on container hire or sales give us a call on 07 5534 7181. Otherwise send your enquiry via our contact form.